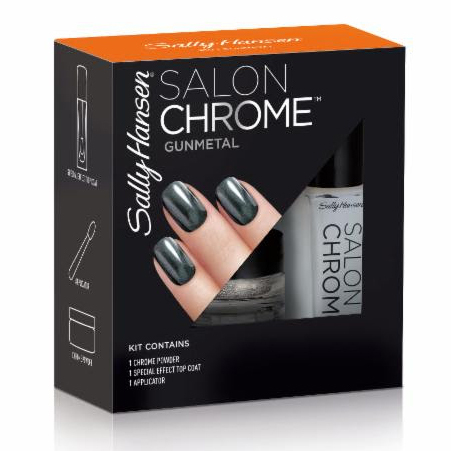 The chrome look now comes home with Sally Hansen Salon Chrome™. 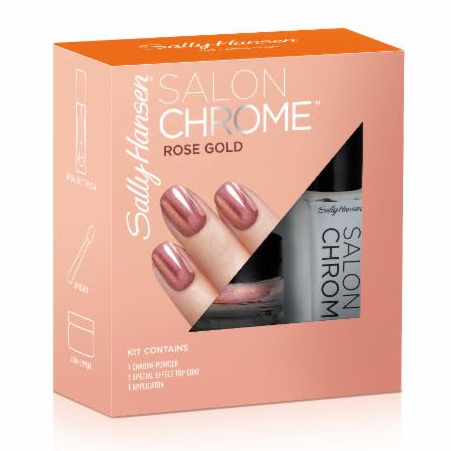 The leader in creating salon-inspired nail innovation at home, Sally Hansen has captured one of the biggest social media nail trends of 2017 and will introduce the first DIY nail kit to ever launch in the US for the ultimate #chromenails. This trend has exploded recently and has been seen everywhere from street style to style icons, with over 385,000 posts on Instagram alone, but was previously only achieved with UV light and a lengthy application process. Sally Hansen Salon Chrome™ kit contains Chrome powder, Special Effect Top Coat and Sponge Applicator. Get ready to show off your “Instaglam” nails and watch the “likes” rack up. Apply two thin coats of Miracle Gel in Blacky O (for Peacock, Holographic, Gunmetal and Mermaid looks) or Miracle Gel in Frill Seeker (for Rose Gold look) and allow to dry until tacky, 2-3 minutes. Dip included Applicator into Chrome Powder & rub a small amount onto surface of nail in a back & forth motion using light pressure; watch effect appear! Apply one thin coat of Special Effect Top Coat & allow to completely dry for 5 minutes. The new Sally Hansen Salon Chrome™ kits in Mermaid, Rose Gold, Peacock and Gunmetal will be available on Target.com beginning mid-August for $20 each. The Sally Hansen Salon Chrome™ kit in Holographic can be exclusively found at Ulta stores and on Ulta.com in October for $30. This exclusive large kit includes the Miracle Gel Black-y O Base Coat and Miracle Gel Top Coat.